PROJECT SUMMARY: This home has a beautiful mixture of stone and brick to showcase. What better way to bring attention to the details than professional outdoor lighting! This home sits low on the lot and was very dark from the street. Professional outdoor lighting was desired to help enhance this properties appearance and make the front elevation pop when the sun goes down. LANDSCAPE LIGHTING FOCUS: The main landscape lighting focus on phase I was to ensure instant curb appeal from the street, circle driveway, and front elevation of home. Landscape lighting really allows us to capture the space in a more intimate and natural way than traditional line voltage (120v) flood lights. Accent landscape lighting helps create drama and detail on architecture. Safety lighting was needed to address the elevation changes throughout the property and along the long driveway. LOCATION: The lighting designs and installation for this project can be found in Summerfield, NC 27358. Grazing the homes architecture correctly was very important to bring out the detail of the brick and stone. Proper fixture placement and LED wattage was critical to bring this lighting design to life. Adding outdoor landscape lighting and giving our client remote access through a smartphone made all the difference for their sense of security. Coming home to a beautifully lit home and landscape instantly sets the mood and helps separate the stress of life, with the calmness of home. 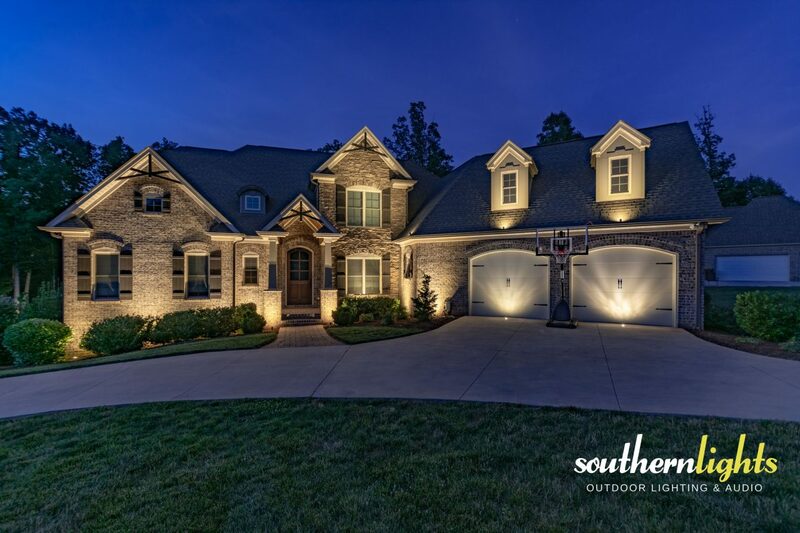 Southern Lights knew from the beginning that this home was going to need more landscape lighting fixtures in the future with an added phase down the road, so right sizing cable, transformer, and amperage on the system was important. The home, driveway and garage areas were overly dark on a street that also had very little ambien light. Designing the lighting system so that effect would flow seamlessly across the front elevation and garage was important. Getting the correct light onto garage required Southern Lights to core drill for flush mounted well lights into driveway centered on the middle of the garage doors. These well lights allow us to continue the light across the eaves keeping the architecture lit in the same manner which adds to the balance in this lighting design. Another critical piece of this lighting design were the dormers. Dormers usually need separate fixtures designed and installed in the gutters. Dormers are a great detail in a home’s architecture that look great lit at night. They are needed to help illuminate and carry the landscape lighting effect across the architecture evenly. Custom gutter mounted fixtures were utilized to highlight the dormers. The existing landscape was fairly mature, so keeping the plant material properly pruned will be an ongoing maintenance need for these clients to keep the lighting design in tact for years to come and to reduce unnatural shadows on the architecture. This client ultimately trusted Southern Lights with the lighting designs allowing us to provide them with the most ideal landscape lighting effect with the best lighting fixtures for the space and structures. We think it turned out pretty awesome!